Problem Solving With Hero Zero. This symbols never lies. = means same. Here is what many consider a novel approach to problem solving. Hero zero makes an appearance and over time problem solving this way will be second nature. You job is to get them to understand equals means SAME and introduce the concept of hero zero and sometimes same is NOT visually obvious and we have to get help from our hero zero. In the problem 5x + 16 = 4x +12 we are going to end up with NOTHING on one side. We have a symbol for nothing ZERO. a few more and these kinds of problems won't be scary at all. 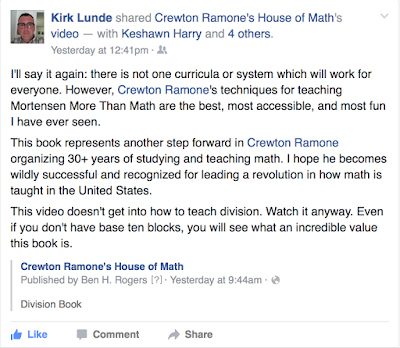 Find out more about the best ways to use your base ten blocks at Crewton Ramone's house of math. Get my book on subtraction, Crewton Ramone's Supremely Simple Subtraction it also covers the basics of this kind of problem solving. These concepts can be taught to and understood by even very young students. Hopefully you begin to see how it all goes together...check out this what's under the cup video and you can see problem solving introduced in the most basic way with what's under the cup. When we bust out hero zero we have moved down the road a little. But 5 + x = 10 and 8 + x = 10 and 3 + x = 8 are great ways to start with the CONCEPT of making same and then finding same on both sides is a natural progression. Moving from whats under the cup to seeing 8 + x = 10 = 8 + 2 therefore x must be two is just another more complicated way of playing what's under the cup, but to kids who have played what's under the cup at an early age the symbols make sense because they have SEEN what the symbols represent from an early age. A year later at Sweet 16, but now Sweet 16 is about to turn 21. This is a fun video covering some basic concepts in geometry. Basically, I demystify distance formula for a giggly girl. Pythagorean theorem. I always looked forward to fooling around with math with her because we always ended up laughing our butts off. (See second video.) And this usually led to sloppy notation on my part. The point is she was understanding the fundamental concepts. 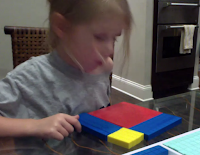 There is a point in the video where I write out distance formula and fail to put the 2's in for the squares...very annoying looking back but she fully understood they were squares. Other than that, I hope you see how teaching her the fundamental concept of a² + b² = c² improved her understanding dramatically and therefore her grade. Then she could see that a was equal to the difference of x's and b was equal to the difference of y's. Look at how many less symbols I need to say it mathematically. Then we have to square them and then square root them AFTER we add them together. a little "gussied up" as my grandma would say. Anyhow there should be 2's there...but as I said the lesson was understood. 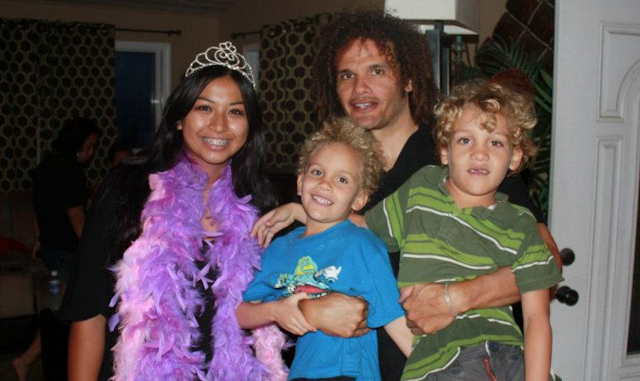 Anyhow I dug this out of the archives. The first video hasn't been seen by anyone but me. The second one as I type this has about 50 hits. We always just laughed and laughed and laughed. Before me, math made her cry. It was those tears that made her dad break down and call me. These are typical high school math lessons right out of the textbook. I claim exemption from copyright under the education purposes only clause. This blog is free to view and so is the video. Besides these types of questions and horrid explanations certainly are not unique to this text book manufacturer. Often I barely have time to develop concepts because the book covers so much in just a few pages. And people say I skip around. What a joke. Take a look at the topics covered in that first video...the way they are presented the kids can't figure out it's all basically the same concept...just variation of applying algebra and Pythagorean theorem to get the job done whether it was distance or mid-points. Learn how to use base ten blocks. 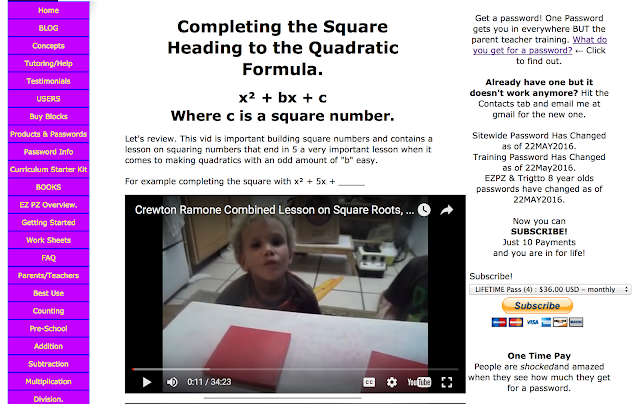 Completing The Square New Password Protected Page. Me trying to complete the completing the square pages. 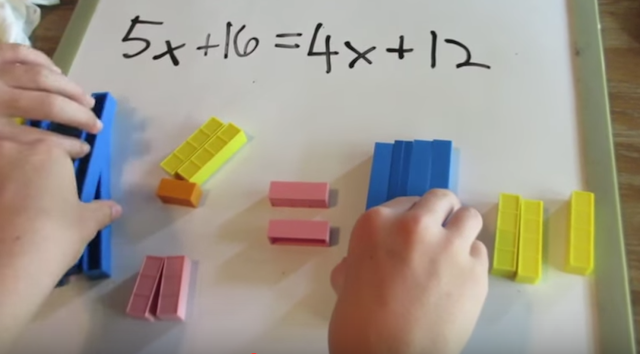 I hope you can see that part of this is showing you repetitive lessons that get the students ready for "advanced" mathematics, but it's not advanced if the various parts are easily understood. Basic concepts like understanding the equals sign means SAME dividing by two, what a square number is and what square root means need to be understood and internalized WHILE we learn concepts in algebra. Being able to write an expression different ways but have it be the same just in different forms need to be understood too. Just playing with square numbers at an early age teaches so much, and more importantly makes life easier later. 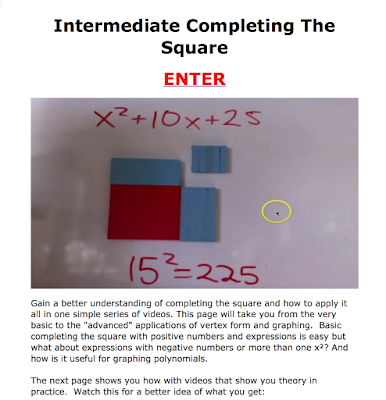 This page takes you from lessons with toddlers to lessons with high school students all centering around completing the square. From things as simple as multiplying and dividing by two, building and knowing square numbers, how to square numbers that end in 5, square numbers whose roots we call radicals--so many fun things we can do with with square numbers including delve into the imaginary.Don't worry we won't go there this time around, but we will head down the road to understanding where the quadratic formula comes from and how to derive it. But we get there in baby steps. Understanding basic concepts along the way. 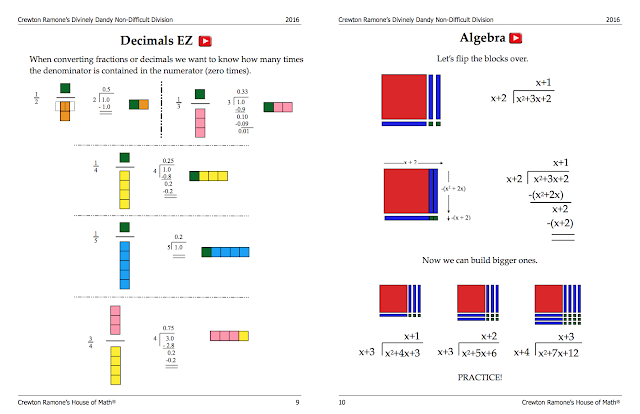 which is the entrance page to a nice little page chock full of lessons on completing the square and square numbers. It even contains a link to this blog that you may have missed because it's a few years old, driving home the point that the posts get old but not the lessons on those posts. The page has videos that very few people have seen according to their hit count on youtube because they are not public (I'm talking to you Shalynn). Start at the top and work your way down. Now that you know where you are going maybe you will look at those early videos differently. The password you need is the sitewide password. Those that have a lifetime pass just got ye more value for money already spent. You won't find the videos on these pages anywhere else. They don't come up in searches, you have to know the link. Here is a much more detailed tour of what you get on this page. I could make a PDF on this one topic alone like Supremely Simple Subtraction or Divinely Dandy non Difficult Division--but it's going to be awhile. Please come back and leave a comment for others. Divinely Dandy non Difficult Division is in fact done. Now I just, have to get out to you. 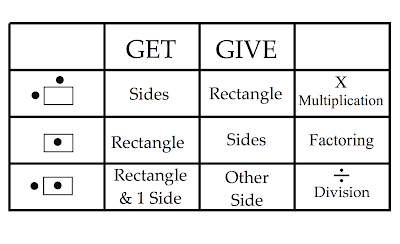 Division is basically being able to make a rectangle and describe the sides using numbers. If you have already have a password. DON'T CLICK this link and buy until you check your email for the promocode that gives you half off. If you have ever gotten a password or product from me don't click link check your email instead you may get a promo code. There are only 300 promocodes. There are more than twice as many emails as that going out. So don't delay. Also be aware that if you only ever got SSS for free you won't be getting a promocode just an email informing you that it's ready, so no rush. Buy it below for $19.99. Concept number three: we form rectangles to facilitate counting. Many people think division, factoring and multiplication are three different things instead of variations on a theme or ONE thing.. In divinely Dandy non Difficult Division I show you plainly it's the same thing and best of all it's easy. I also show you how to use the rectangle to organize thought. I left out Trig on purpose because people think triangles are hard and there will one day be a book like this on trig alone. Hopefully, you can see how C= ΠD and 18 = 3x6 and sin30° = 1/2 go together using the rectangle but if not, it will be spelled out for you at a later date. As with all of my books so far it wasn't what to put in, but what to leave out. I put examples of problems that work out perfectly to start but there are also remainders and ones that don't work out evenly. 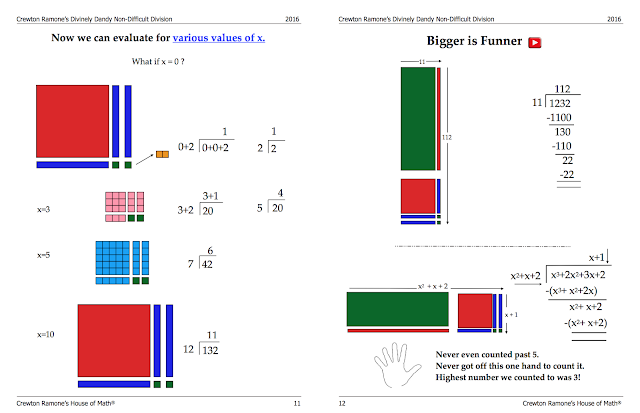 Fractions will one day have it's own book and so will percentages so I lightly touched on those topics here but basically focused on "long" division concepts in a very traditional manner but without all the constrictions of traditional teaching without base ten blocks or manipulatives. I also included more instructional pages that were mostly made by Andrea and Sonya but I edited and added a little to it because the primary axiom is keep it simple. So you are getting two books in one. There are 24 pages of meat and potatoes and just a few pages of fluff...like the title page and dedication page and I just noticed the people who made this PDF didn't give themselves a credit page. I assure you I didn't pull this off alone. 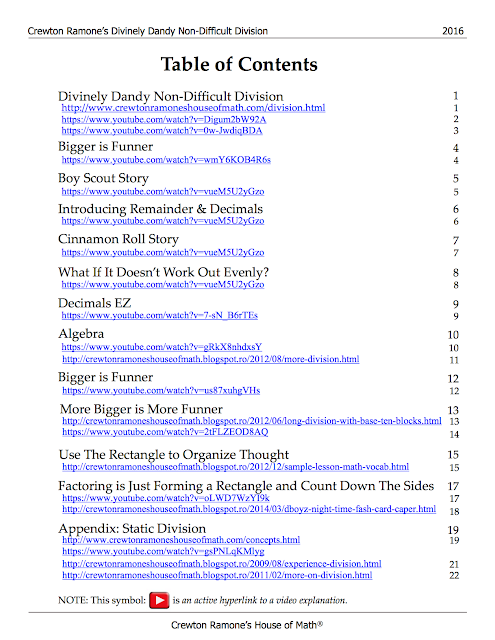 It also has hypertext you can click that will take you to The House Of Math's Division pages, division is covered here on this blog too. Dig around a little. The idea is with this book when it comes to division you won't have to dig anymore: it's all laid out for you. I am so pleased with this book that I'm actually doubling the price to 20 bucks. But for a limited number (not a limited time) I will be selling a few hundred copies at a lower price, WITH the understanding that you guys will put comments in the comments boxes of the sales pages so people can see that it's not just me. Supremely simple subtraction does well because it has at the time of this writing 51 comments from people other than Crewton Ramone. Please take a moment to comment or hit like on some one else's if you haven't already. The first hundred will get it for 10 bucks. The next for 12.95, the next for 14.95 which is the price I was planning on leaving at for the duration but instead I will attempt to reward the people who have supported me in the past with a lower price and a first look. After the first 300 copies go out, it will be 19.99. I am amazed to see that I have over 500 unique names on various lists...60% of them will get a discount. I assume most people will want it after seeing the subtraction book, plus I'm testing out an "upsell" feature where you will be offered The Curious Counters' Compendium for two bucks more. If you have a password, you won't want this because it's already FREE with your password. HOWEVER quite a few of you have this book and there are only three comments on the page. Please take a moment to comment or hit like on some one else's if you haven't already. So bossy, I know, but it really makes a BIG difference. The table of contents usually comes in the front but this book is short enough I put it in the back along with links to videos for further instruction. Here is a video that shows the whole book. Get your own copy instantly.